I was on a roll yesterday. I'd been thinking about this cute little bunny design that would slip over a wine cork and sit on the table, only when I made the first one the idea didn't work. 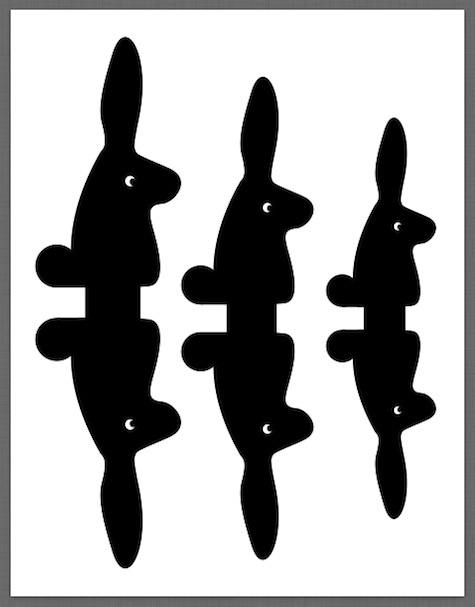 I did design a cute little bunny in iDraw but when I cut it out, the plan just didn't come together. It was lumpy and awkward. 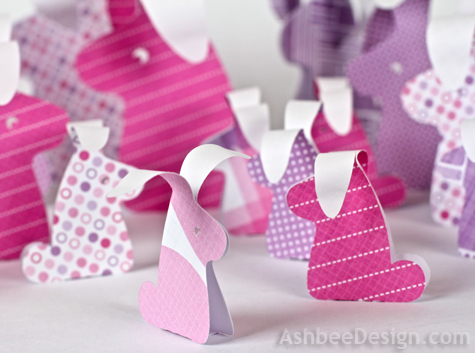 So instead I made a built-in paper base and the next thing I knew I'd made 30 bunnies. This was so EASY to do! I had a wonderful stack of matching papers. These are bunnies - they reproduce fast! I purchased one of those big books of 12 x 12 papers for scrap booking on sale last year. It had a perfect array of spring pastels in many prints and I went wild in the pink and purple section. 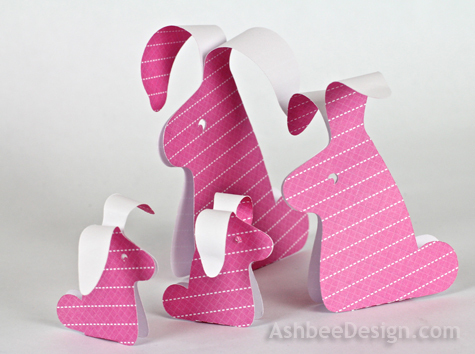 From each sheet I could cut a family of bunnies. 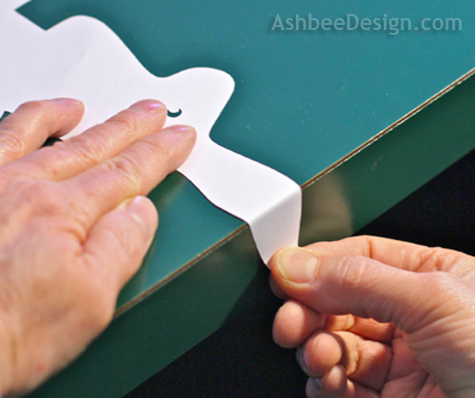 Here are some quick 'how-to" photos so you can see how simple this project is. I started in iDraw and sketched the one bunny which I then duplicated and flipped. I connected the bases with a rectangle. I duplicated it and reduced the size. 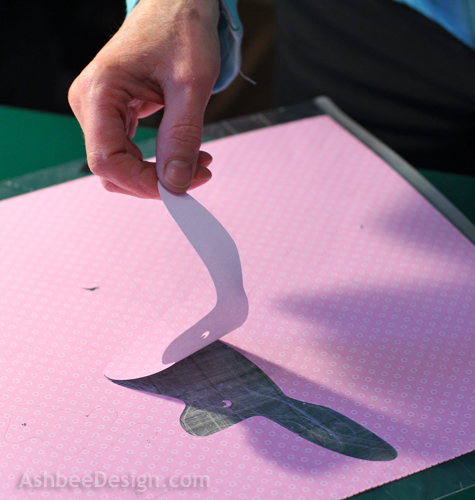 My drawing is all in black to import into Silhouette but for those of you with out a silhouette, you can just print the patten and trace it onto paper to cut by hand. I explored this design as a pdf file and opened it in the Silhouette Software. I traced it and then cut it using my silhouette Cameo. 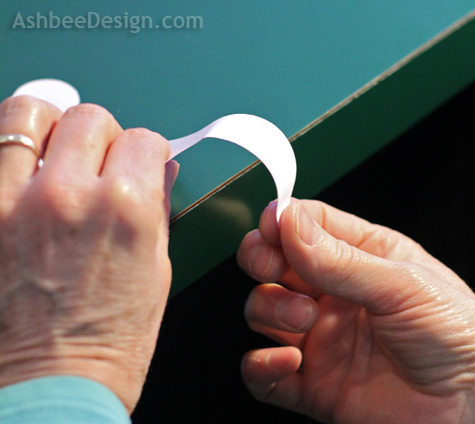 As I noted above, this is certainly easy enough cutting to do by hand. 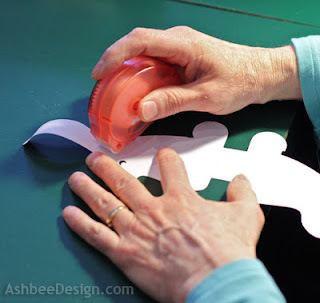 Although the Silhouette made it faster, it isn't required. 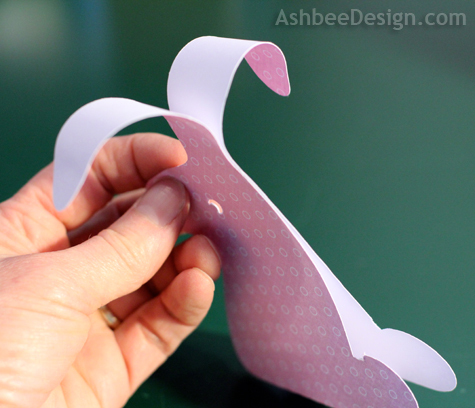 Note: This projects works better with paper not card stock. Once cut, I peeled them off the mat. I then pulled each ear over the sharp edge of my craft table to curl the ears. 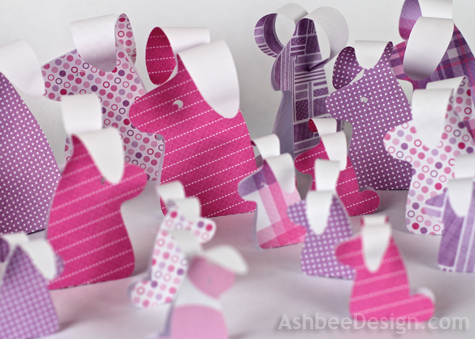 You pull each ear over the edge with the print side of the paper down. 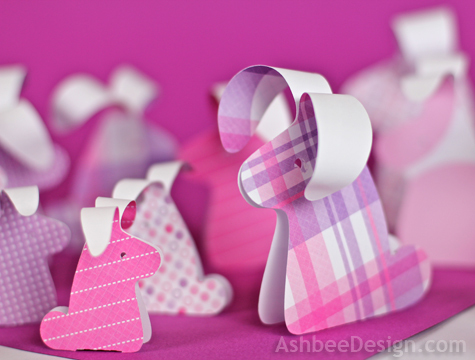 Fold the bunny along its base on each side. 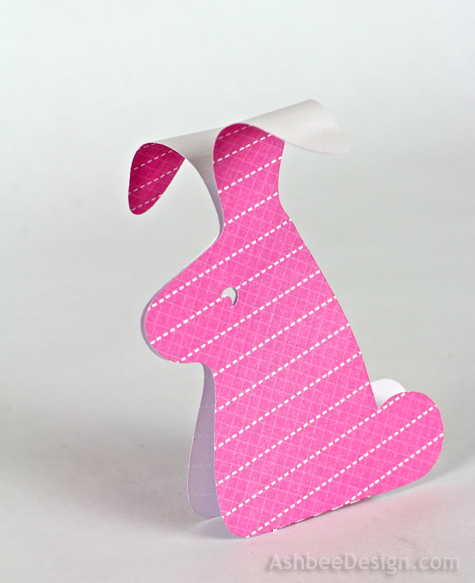 This forms the spacer and support for the standing bunny. I then applied a glue dot in the center of the head right below the ears. And pressed the two halves together. And another bunny joins the bunch! And hops off to join the others. I think I need to make some tufts of grass for them! This is too cute for words! Thank you for the inspiration! Hope you can stop by the enchanted oven to say hi. Adorable -- love the ear bending technique! The ears are what makes this design special. I am working on a puppy dog now..awwwwwww. Adorable! 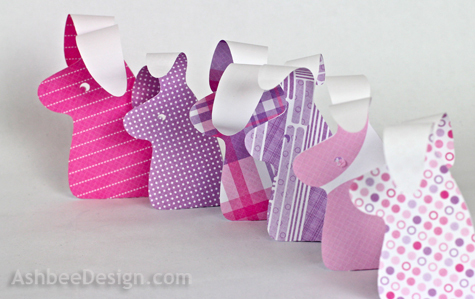 I love cute projects like this, where you can have such fun mixing up a variety of beautiful patterned papers. Ah, beautiful papers! Such a weakness! Thanks for visiting and commenting. I think these need a little denim egg to carry. So adorable! Great idea! Think I'll go make some, Oh I already did :-). HOw about ombré eggs instead. Check out my March 6 post. So cute! These would make a great addition to my Easter brunch table. And mine as well. Check out my March 6th post. Yes, and they are so easy to make that you can make and share tons of them. Love the features! That and comments are my reward for the work. Thanks! I'm in LOVE with your little bunnies!! Oh so CUTE!! I am sure I'll something for tomorrow. So so adorable!! Thanks for linking up at Romance on a dime!! And thanks to you for having the party and coming by to visit.